Ndaba Mazabane is an associate Pastor at Rosebank Union Church. 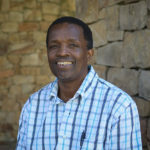 Ndaba served as the President of the Association of Evangelicals in Africa (AEA), appointed as the Chairman of the International Council of the World Evangelical Alliance (WEA) and is the Chairman of the of the International Bible Society-Send The Light (IBS-STL) , Southern Africa and member of the Africa Advisory Council of IBS-STL. Ndaba is married to Maggie and are blessed with three children, two boys and a girl. Holding the whole world in your hands!